In Defense of the Colonies is a speech given by William Pitt in Parliament on January 14, 1766 defending the colonists in their anger against the Stamp Act. Pitt believed the Stamp Act was completely illegal and violated the British Constitution because the colonists had no elected representatives in Parliament. Many in Parliament were defending the Stamp Act with the idea that the colonists were "virtually represented" by other elected officials, even though they hadn't elected them themselves. 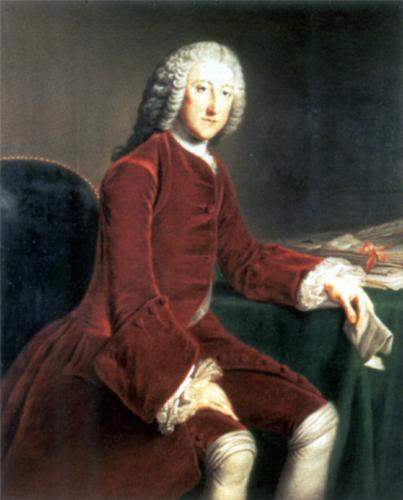 The idea of virtual representation is discussed more fully in The Regulations Lately Made by Thomas Whately, the chief author of the Stamp Act and secretary of Prime Minister George Grenville (who was Pitt's brother-in-law). As a result of this speech, Pitt became a hero in the eyes of the American colonists. This speech was one of several events that persuaded Parliament to repeal the Stamp Act in March, 1766. You can read more about the history of the Stamp Act or read the Stamp Act of 1765 text here. You can read In Defense of the Colonies by William Pitt below. Gentlemen, sir, have been charged with giving birth to sedition in America. They have spoken their sentiments with freedom against this unhappy act, and that freedom has become their crime. Sorry I am to hear the liberty of speech in this House imputed as a crime. But the imputation shall not discourage me. It is a liberty I mean to exercise. No gentleman ought to be afraid to exercise it. It is a liberty by which the gentleman who calumniates it might have profited. He ought to have desisted from his project. The gentleman tells us, America is obstinate; America is almost in open rebellion. I rejoice that America has resisted. Three millions of people, so dead to all the feelings of liberty as voluntarily to submit to be slaves, would have been fit instruments to make slaves of the rest. I come not here armed at all points, with law cases and acts of Parliament, with the statute book doubled down in dog's ears, to defend the cause of liberty. If I had, I myself would have cited the two cases of Chester and Durham. I would have cited them to show that, even under former arbitrary reigns, Parliaments were ashamed of taxing a people without their consent, and allowed them representatives. Why did the gentleman confine himself to Chester and Durham? He might have taken a higher example in Wales -- Wales, that never was taxed by Parliament till it was incorporated. I would not debate a particular point of law with the gentleman. I know his abilities. I have been obliged to his diligent researches. But, for the defense of liberty, upon a general principle, upon a constitutional principle, it is a ground on which I stand firm -- on which I dare meet any man. The gentleman tells us of many who are taxed, and are not represented -- the India Company, merchants, stockholders, manufacturers. Surely many of these are represented in other capacities, as owners of land, or as freemen of boroughs. It is a misfortune that more are not equally represented. But they are all inhabitants, and, as such, are they not virtually represented? Many have it in their option to be actually represented. They have connections with those that elect, and they have influence over them. The gentleman mentioned the stockholders. I hope he does not reckon the debts of the nation as a part of the national estate. Since the accession of King William, many ministers, some of great, others of more moderate abilities, have taken the lead of government. [Here Mr. Pitt went through the list of them, bringing it down till he came to himself, giving a short sketch of the characters of each, and then proceeded.] None of these thought, or even dreamed, of robbing the colonies of their constitutional rights. That was reserved to mark the era of the late administration. Not that there were wanting some, when I had the honor to serve his Majesty, to propose to me to burn my fingers with an American stamp act. With the enemy at their back, with our bayonets at their breasts, in the day of their distress, perhaps the Americans would have submitted to the imposition; but it would have been taking an ungenerous, an unjust advantage. The gentleman boasts of his bounties to America! Are not these bounties intended finally for the benefit of this kingdom? If they are not, he has misapplied the national treasures! I am no courtier of America. I stand up for this kingdom. I maintain that the Parliament has a right to bind, to restrain America. Our legislative power over the colonies is sovereign and supreme. When it ceases to be sovereign and supreme, I would advise every gentleman to sell his lands, if he can, and embark for that country. When two countries are connected together like England and her colonies, without being incorporated, the one must necessarily govern. The greater must rule the less. But she must so rule it as not to contradict the fundamental principles that are common to both. If the gentleman does not understand the difference between external and internal taxes, I can not help it. There is a plain distinction between taxes levied tor the purposes of raising a revenue, and duties imposed for the regulation of trade, for the accommodation of the subject; although, in the consequences, some revenue may incidentally arise from the latter. The gentleman asks, When were the colonies emancipated? I desire to know, when were they made slaves? But I dwell not upon words. When I had the honor of serving his Majesty, I availed myself of the means of information which I derived from my office. I speak, therefore, from knowledge. My materials were good. I was at pains to collect, to digest, to consider them; and I will be bold to affirm, that the profits to Great Britain from the trade of the colonies, through all its branches, is two millions a year. This is the fund that carried you triumphantly through the last war. The estates that were rented at two thousand pounds a year, threescore years ago, are at three thousand at present. Those estates sold then from fifteen to eighteen years purchase; the same may now be sold for thirty. You owe this to America. This is the price America pays you for her protection. And shall a miserable financier come with a boast, that he can bring "a pepper-corn" into the exchequer by the loss of millions to the nation? * I dare not say how much higher these profits may be augmented. Omitting the immense increase of people, by natural population, in the northern colonies, and the emigration from every part of Europe, I am convinced that the commercial system of America may be altered to advantage. You have prohibited where you ought to have encouraged. You have encouraged where you ought to have prohibited. Improper restraints have been laid on the continent in favor of the islands. You have but two nations to trade with in America. Would you had twenty! Let acts of Parliament in consequence of treaties remain; but let not an English minister become a custom-house officer for Spain, or for any foreign power. Much is wrong! Much may be amended for the general good of the whole! Does the gentleman complain he has been misrepresented in the public prints? It is a common misfortune. In the Spanish affair of the last war, I was abused in all the newspapers for having advised his Majesty to violate the laws of nations with regard to Spain. The abuse was industriously circulated even in handbills. If administration did not propagate the abuse, administration never contradicted it. I will not say what advice I did give the King. My advice is in writing, signed by myself, in the possession of the Crown. But I will say what advice I did not give to the King. I did not advise him to violate any of the laws of nations. As to the report of the gentleman's preventing in some way the trade for bullion with the Spaniards, it was spoken of so confidently that I own I am one of those who did believe it to be true. The gentleman must not wonder he was not contradicted when, as minister, he asserted the right of Parliament to tax America. I know not how it is, but there is a modesty in this House which does not choose to contradict a minister. Even your chair, sir, looks too often toward St. James's. I wish gentlemen would get the better of this modesty. If they do not, perhaps the collective body may begin to abate of its respect for the representative. Lord Bacon has told me, that a great question would not fail of being agitated at one time or another. I was willing to agitate such a question at the proper season, viz., that of the German war -- my German war, they called it! Every session I called out, Has any body any objection to the German war? Nobody would object to it, one gentleman only excepted, since removed to the Upper House by succession to an ancient barony. He told me he did not like a German war. I honored the man for it, and was sorry when he was turned out of his post. A great deal has been said without doors of the power, of the strength of America. It is a topic that ought to be cautiously meddled with. In a good cause, on a sound bottom, the force of this country can crush America to atoms. I know the valor of your troops. I know the skill of your officers. There is not a company of foot that has served in America, out of which you may not pick a man of sufficient knowledge and experience to make a governor of a colony there. But on this ground, on the Stamp Act, which so many here will think a crying injustice, I am one who will lift up my hands against it. In such a cause, your success would be hazardous. America, if she fell, would fall like the strong man; she would embrace the pillars of the state, and pull down the Constitution along with her. Is this your boasted peace -- not to sheathe the sword in its scabbard, but to sheathe it in the bowels of your countrymen? Will you quarrel with yourselves, now the whole house of Bourbon is united against you; while France disturbs your fisheries in Newfoundland, embarrasses your slave trade to Africa, and withholds from your subjects in Canada their property stipulated by treaty; while the ransom for the Manillas is denied by Spain, and its gallant conqueror basely traduced into a mean plunderer! A gentleman whose noble and generous spirit would do honor to the proudest grandee of the country? The Americans have not acted in all things with prudence and temper: they have been wronged; they have been driven to madness by injustice. Will you punish them for the madness you have occasioned? Rather let prudence and temper come first from this side. I will undertake for America that she will follow the example. There are two lines in a ballad of Prior's, of a man's behavior to his wife, so applicable to you and your colonies, that I can not help repeating them: "Be to her faults a little blind; Be to her virtues very kind." Upon the whole, I will beg leave to tell the House what is my opinion. It is, that the Stamp Act be repealed absolutely, totally, and immediately. That the reason for the repeal be assigned, viz., because it was founded on an erroneous principle. At the same time, let the sovereign authority of this country over the colonies be asserted in as strong terms as can be devised, and be made to extend to every point of legislation whatsoever; that we may bind their trade, confine their manufactures, and exercise every power whatsoever, except that of taking their money out of their pockets without their consent.